At San Diego Self Storage, we believe that community involvement is at the forefront of what differentiates our company from competitors. Each year, we look forward to our San Diego Food Bank Drive and the Toys for Tots campaign. And throughout the year, each of our locations generously donates time and funds to their favorite and local charitable organizations. The team at San Diego Self Storage’s corporate office is delighted to support several more San Diego-based charities through the year, such as the San Diego Gulls Foundation, Connor’s Cause, Big Brothers, Big Sisters Program, Doors of Change, the San Diego Police Department's K-9 Unit and so many more. From humble beginnings in 1960 with a few women deciding to deliver meals to their elderly neighbors, to serving nearly a half a million meals throughout the entire county today, Meals on Wheels is devoted to the health, safety and well-being of San Diego seniors. Meals on Wheels is the only agency providing meals for 7 days a week, including holidays. Currently the program covers the entire county, including delivery into the over 3,049 square miles of rural and unincorporated areas. 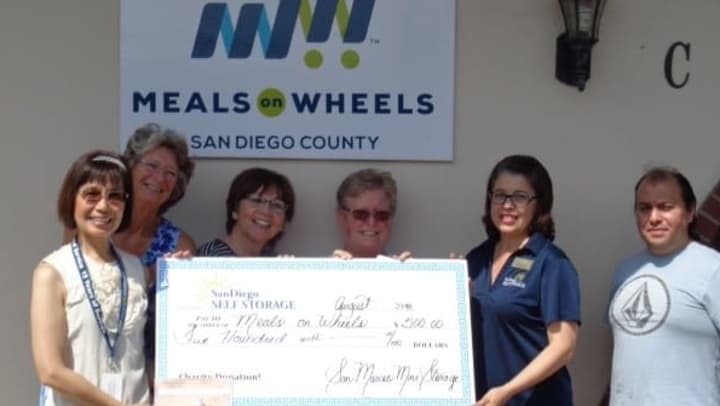 Meals on Wheels San Diego County subsidizes 60% of the costs for meals, delivery, and other services provided, regardless of a senior’s ability to pay. Our team at San Marcos Mini Storage decided to make their donation to the Meals on Wheels San Marcos facility. The Meals on Wheels San Marcos volunteers serve over 500 clients in their area. They also have an animal food program for their clients along with providing holiday and birthday gifts. The San Marcos Mini Storage team was delighted to provide their charitable gift to such a deserving program with wonderful volunteers. Pictured above from left is Manager, Charlotte Fan, Pat Avelino, Melinda Brady, Cyndi Shy, Alicia Cardenas (SMMS Facility Manager) and Freddy Garcia.